7E Chronicles Extra: New Ridge Reaper Gear!! I know I gush over Under Armour Ridge Reaper, but look at this photo...can you find me? It's that good! The 7E Chronicles, sponsored by Gaia GPS (sign up here with a discount). Camo gear provided by Under Armour Ridge Reaper (shop here on Amazon ). 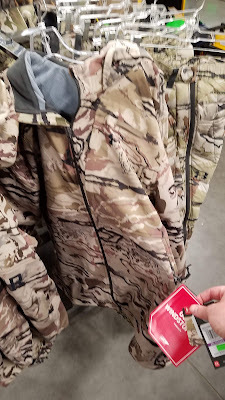 I went to the Sportsman's Warehouse customer loyalty sale last night intending to just grab a few things for sighting and cleaning my new rifle and on the way back to the shooting section I walked right past the camo and saw that they have all sorts of new UA Ridge Reaper gear, so I got stuck there for about 45 minutes marveling over the new items and trying things on. Let me tell you, it takes dedication to try on a down coat layered under a Gore-Tex coat when it's still over 100 outside and you've spent the day moving furniture. The pictures aren't great since I just took some quick shots as I tried to wrap up my shopping, but they still give a good sense of what's new! 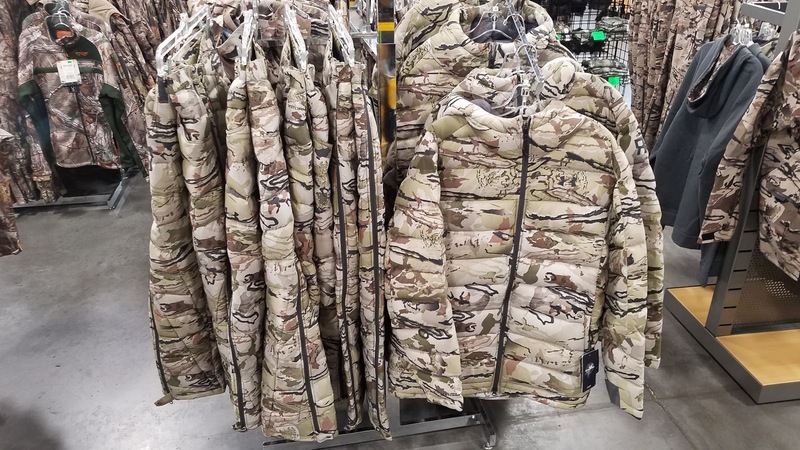 The UA website has several new items in the Ridge Reaper Barren line--the most exciting on their site are the Raider pants (pictured right) and jacket (not pictured). Sportsman's also had both of these for me to check out in person. The jacket is a nice lightweight windbreaker type jacket. It'd be good for crisp days by itself, or as an outer layer over fleece or wool. The pants are fantastic. They have an articulated knee that looks like an armadillo shell. My first thought was "that looks gimmicky" but after trying on a pair of pants I was sold. The armadillo shell gives the pants room to expand whenever you crouch or kneel. Instead of riding up around the ankle, the fabric around the knee accommodates a full range of motion. 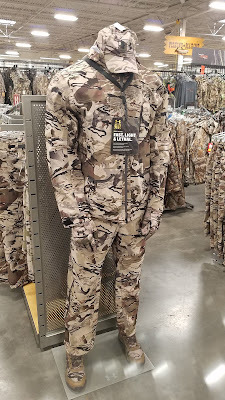 The most exciting stuff was what's only in the Sportsman's Warehouse store or on the Bass Pro Shops website (maybe in store too, haven't been lately). 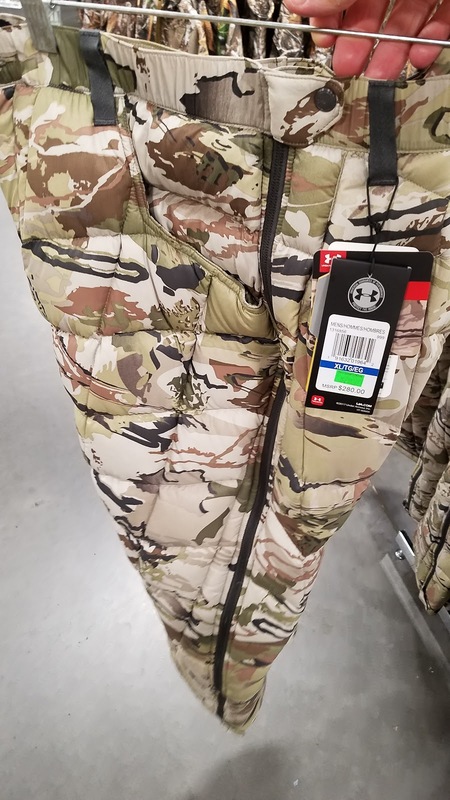 Not sure why the UA website doesn't have the whole line yet, but that's consistent with years past where UA will feature some items but you have to shop all the hunting retailers to find everything. 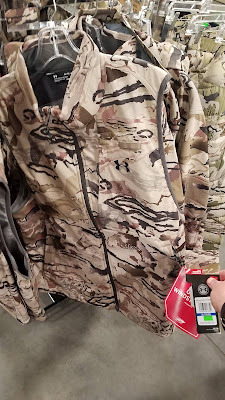 The best way to find things on the UA website is to search all men then refine by camo color, for some reason if you go to the Ridge Reaper page only a couple items come up. Similarly, go to BassPro.com and search for Under Armour then refine by Hunting Clothing to see their items. The Ridge Reaper Pants, Vest, Jacket, and gloves, featuring Gore Windstopper, are hopefully going to find a place in my closet for the elk season. Each have a lightly insulated, brushed interior for some warmth. The outer material is fairly quite and pliable, but there is a light "whishing" sound when it rubs against itself. Theoretically, it seems quite enough not to cause problems so long as you're conscientious about movement. I was happy to find that the pants, which feature the same armadillo knee, were long enough to fit me (the knee definitely helps). They're listed as having about a 32" inseam (I typically wear 34"), but they were fine for me length-wise. One disappointment is that the sleeves on the jacket were shorter than other UA outerwear I've owned or tried on. I had to go up to XXL to find a sleeve that fit, as compared to the other jackets I tried on yesterday that fit great in XL. If you're expecting real extremes, go for the pants and coat with full on Gore-Tex waterproofing. I haven't seen these on anyone's website, so they were a real treat to find at Sportsman's. 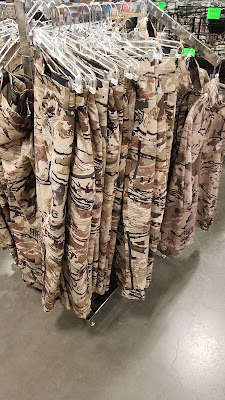 These are fantastic looking pieces of camo, and felt great too. I did not try on the pants, but was glad to see they feature full-leg zipper so you can pull them on over whatever you're already wearing. I did put on the jacket, which fit me great in XL (for reference, I wear large or XL t-shirts and dress shirts are a 16.5x37). These pieces are a bit louder as they do have the waterproofing of Gore-Tex, so unless you're in serious wet conditions they might not be the items to go with. Another nice surprise was finding the down coat that I've heard rumored. And even nicer was seeing the down pants to go with them (pictured below). 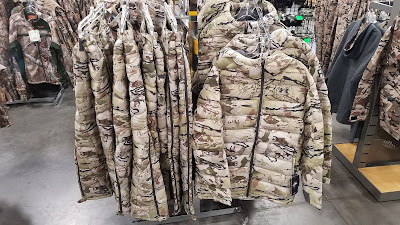 I still haven't found either online, but Sportsman's Warehouse has them in store. Talk about a great way to stay warm in a tree stand or on an exposed ridge glassing for elk! The jacket did seem a bit bulky even for down, but still compressed down decently when I balled it up and pulled it tight. And the XL down jacket mostly fit under the XL Gore-Tex coat. It's not clear if the down pieces are intended to be worn as outer layers or as mid-layers. I'd typically use down as a mid layer with something windproof/resistant over it. But the jacket was a couple inches longer in the body than the waterproof coat so it wouldn't be fully protected from the elements under the Gore-Tex. It also made for a snug fit that I wouldn't want to be in for longer than necessary. By itself, however, the down coat was super comfortable. The down pants seemed more compressible than the jacket and I immediately thought I found the solution to cold morning hunts in Virginia, but the inseam on these was definitely closer to the 32" that comes standard on most UA Ridge Reaper pants when they're released for the first season, so I'll have to wait until next year to consider them. Hope you're as thrilled about the new pieces as I am...nothing screams "hunting season is around the corner" more than new camo gear hitting the shelves.